I'm going to go with the fib as the last one--about only eating bananas that are brown and smushed, but only for the selfish reason that I despiiiise brown and smushed bananas! Yay for the Blog Hop! I love your pool quilt. That color is divine and I very well might have to go get me some Kona pool, asap! I am guessing #3 is the fib. That is interesting to hear about your award-winning pies. Pie is my favorite dessert. However, I have yet to master pie making. I just went on vacation to the beach and took a photo through a square cutout of a hedge looking out to the ocean from our pool. 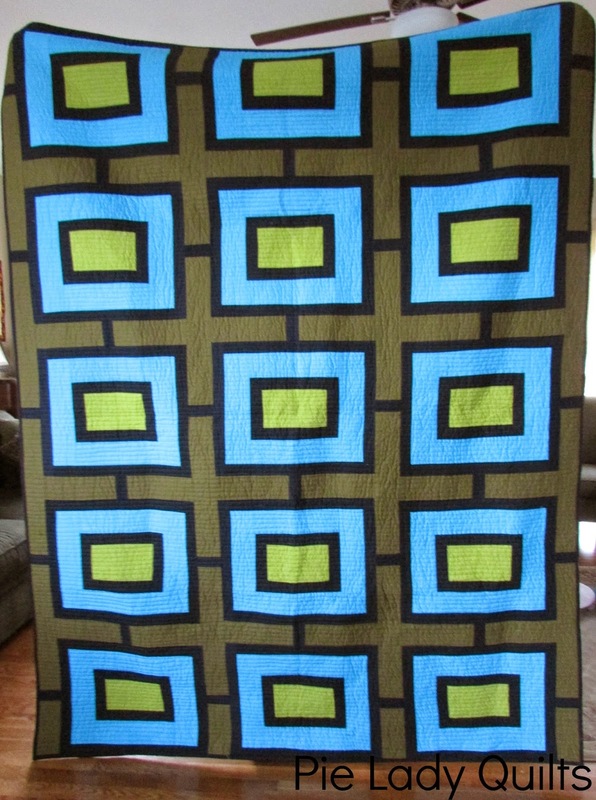 Your pool quilt using that green and blue is stunning and so creative. I guess #1 is the fib. Runts are good. I love your triangle log cabins. I think the "long lasting" hair gel is the fib! LOL What a fun post! Disliking banana flavored candy is a fib? Visiting from the hop group! 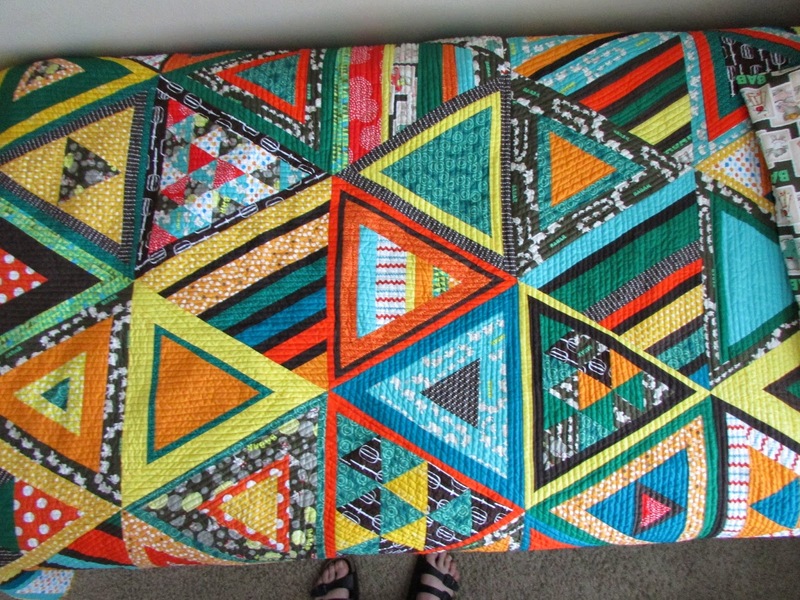 I love your blog and I love your triangle quilt! Good luck on your trip! That is one long way to go with three kiddos! I am about to do the same thing. Tx to Colorado with two kiddos. That is going to be a long move! #2 hair gel but I'm only guessing - no clue really! Love your triangle quilt! I did one too :) I like the way you made your triangles differently, not all log cabin style - adds wonderful visual interest! Please tell me that #3 is a fib. #2 has to be true. As usual I think your quilts are the bomb! I wish I could break away from my traditional trap and go a bit more wild and free. I can do it on the quilting but struggle to do it with the piecing. I love that last triangle quilt....the colors and prints are FANTASTIC (even the egg beaters)...lol. Oh, and I love pie too! Well, I don't really like banana-flavored candies, so I bet that's true. I can picture you (in some unknown context) saying you only eat the smushed ones. And my friends use banana peels for facials, but I can't imagine it would make a very long-lasting hair gel. Am I right? I hope 2 is the fib! I am strongly going with C is the false... For some reason I take it that you aren't into bananas... And o belive children creates all sorts of ways for at home use, I mean, they are just trying to save a few bucks! I don't buy fabric for one specific quilt either, just saw fabrics and therefore my bank accounts stays steady, my stash keeps growing and my quilts keep advancing. I, like Beth, am hoping no.2 is the fib. I'm not sure what it would be like to smell like bananas all day. Your last triangle quilt is beautiful! Ps, I abhor banana candies, all they are good for is sticking up your nose. if you're ten. or particularily bored. 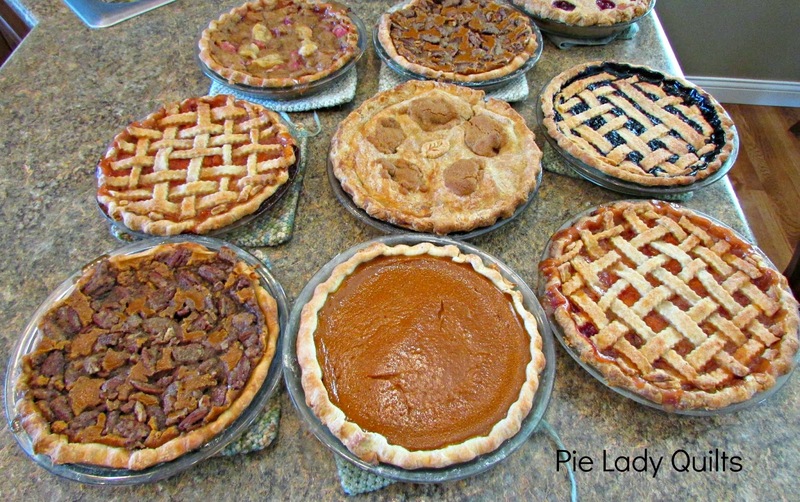 I've been called un-American on many an occasion for not liking pies, Jill : P But kudos to you for the skill and it makes a great story for your blog name. Have a safe trip! I am pretty sure that 2 is true! I think 3 might be the fib. I could never work out why banana lollies didn't taste like bananas. Then, when I was visiting Oman, I ate some of the local tiny bananas. They were really good but they had a slightly different flavour from the bananas I am used to; they tasted like banana lollies! Nice to meet you. I have been working on my stash too. My problem colours turned out to be yellow and orange. Getting better with orange but still struggling with yellow. There isn't quite the right shade of yellow for me. That is my excuse and I am sticking to it, when I find the right shade I will buy some. I'm guessing 1 is the fib...although that would be truth for me, I hate artificial banana flavor! I'm also noticing how my stash falls short. I tend to buy what I'm drawn to, but then it doesn't really work for a project. It's been fun being in a bee, because it forces me to make do with what I've got, and think about making wiser purchases in the future! Your color choices are amazing!! Hmmm...the fib, maybe #3 because everyone's guessing #1. Love your quilts, and that triangle log cabin is wonderful. I'm guessing #3 is your fib. Now let's see if you can guess mine. 1. I've held a lottery ticket worth 7 millions dollars, but had to give it back to the real owner, and then ask for the company we worked for to pay his way to Austin to collect because he was so broke. 2. I drove a 15 passenger van into Mexico for work for 6 months, carrying 1-8 people with me. I went from being a slightly crazy driver to being known as Hell on Wheels. Often having my passengers screaming in a combination of fear and hilarity. 3. I rarely carry my phone with me, and it is always needing a charge. In fact we often have to hunt it down before we leave the house because I've forgotten where it is. I have thought of getting one of those clapping devices for it. I kind of really hope that #2 is the fib, though it would probably smell nice. :D I'm known with my in-laws as the dessert lady -- in fact, I'm making a lemon meringue pie for Father's Day this weekend. You don't happen to have any tips to keep it from weeping, do you? :D It always tastes delicious, and nobody complains about the weeping, but it bothers the perfectionist inside of me. Really fun post and lovely quilts. I very much like the 'what if' attitude to quilting. I'm going with the hair gel as a fib - I don't reckon it could be long lasting! Surely your hair would go from yummy banana smell to rank, bad banana smell quite fast - good wash out conditioner I could believe, but long lasting gel? I reckon not! Your pies look scrumptious. Love your triangle quilt. My baby can also make hair gel out of bananas, so I'm going with number one. Fake banana flavor is hit or miss with me, but I know some detest it. Maybe one of those is you. I also had a baby last spring, if by last spring you mean 2013. I assume that's what you meant since you talked about sitting my the pool with her. She has 2 older sibs like your girl, but I have the female set: 3 daughters! The oldest turned 6 this week. And the medium one will be 4 in August. I love bananas, banana candy--eeeuw!. lol. I love your color sense. Your quilts are gorgeous. Those pies look amazing, especially the blueberry (my favourite). Your quilts are beautiful too. I love your 'try anything' approach to quilting. My Dad's favourite bananas are the brown ones that I think are only fit for making banana bread, but I'm still guessing #3 is your fib. I can't imagine eating a brown, smushed banana! I used to do the same game when I taught adults! I think your fib is #2 - since I have longish curly hair, I am always using various products (bought and homemade). Bananas make a great conditioner (as does mayo) but I don't think it would work well as a hair gel. Who knows, I could be wrong and learn something new. I need to round out my stash as well, but haven't figure out exactly what needs to be added yet. I have more reds and greens than needed so I guess everything else if fair game! Thanks to you I might be making some cookies this afternoon. I used to be a recipe tester for America's Test Kitchen. Love ATK and CI recipes! I say #3 who likes brown bananas? those are for cooking only right :-) Your projects pies and quilts are looking great! Nice to meet you. I am not really a pie person either, but I love your quilts! Hello and nice to have met you through the blog hop! I particularly love your Pantone challenge quilts - great use of colour! I love your Pantone projects and triangle quilts! Nice to meet you. Nice to finally meet you through the blog hop. I posted in the first group. I love pies and yours look as good as your quilts. I think the lie is number 3; that you told your husband you only eat bananas that are brown and smushed. Okay, now I'll go; 1. I love blueberry pie, 2. I love key lime pie. 3. I love lemon chiffon pie. Hope to see more of you in the blogosphere. I love how your little ones are already learning to slow down and appreciate what is around them as they search out quilt designs. It's a good way to see the world. And, I'm going to guess that fact 2 is probably truth. Was there any banana hair gel involved on the long trip? It seems like the type of thing that could happen.